First edition of John Speed's transitional and influential map of Virginia, Maryland, and the Chesapeake Bay. 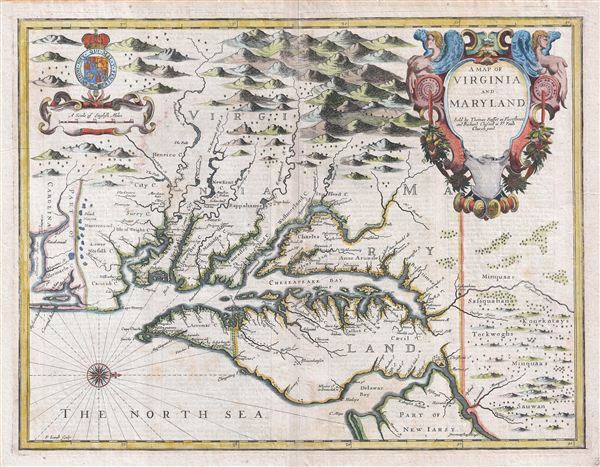 A fine full color example of Francis Lamb's 1676 map of Virginia, Maryland, and the Chesapeake Bay. Oriented to the west, Lamb's map covers from Albemarle Sound to the Susquehanna River and from the Appellation Mountains to the Delaware Bay and New Jersey, inclusive of all of modern day Virginia, Maryland, Delaware, the Chesapeake Bay, and the Delaware Bay. The map notably includes the Chesapeake Bay's western watershed, luring potential colonists with the promise of large navigable rivers and rich fertile lands. The english text on the verso, drawn from Ogilby, further entices with descriptions of Maryland as 'abounding with many fort of fruits and other commodities' and Virginia as 'very wholesome and agreeable to english constitutions.' Indigenous American Indian villages and lands throughout the region are also noted and distinguishable from european cities for the latter being depicted as churches. A fine and large decorative title cartouche of a baroque ethic appears in the upper right quadrant. A secondary cartouche bearing the royal armorial crest of King James II of england hovers over the distance scale in the opposite upper quadrant. Cartographically Lamb's map is considered by scholars to be the ninth and last derivative of John Smith's 1612 map of the same region. It is therefore of considerable significance. In 1673 Augustine Herman issued his own outstanding map of the Chesapeake and the surrounding colonies. Herman's map was a significant step forward in the cartography of the region and the first major deviation from the Smith map. Subsequent cartography, Lamb's included, struggled to reconcile Smith's established cartography with Hermann's more sophisticated treatment. This map, published just three years following Hermann's map - which exists in only four known examples - is the first widely published map to incorporate the new toponymy and geography, thus bringing an end to the influence of Smith on Virginia / Chesapeake cartography and ushering in a new cartographic era for the region. This map was published by Thomas Bassett and Richard Chiswell for the 1676 reissue of John Speed's important 1611 atlas, The Theater of the empire of Great Britaine. The Bassett and Chiswell edition of the Theater incorporated a new supplementary section entitled A Prospect of the Most Famous Parts of the World, which included several maps focusing on the english Colonies in the New World. Because it was published in a 'Speed' atlas, this map is often mistakenly attributed to Speed and is commonly referred to as the 'Speed map of Virginia and Maryland.' In fact Speed had been dead some 47 years by the time Bassett and Chiswell hired Francis Lamb to engrave this map. Speed. J., The Theater of the Empire of Great Britaine, (London) 1676. Very good. Original centerfold exhibits light wear. Platemark visible. English text on verso. Burden (America II) no. 456 State 1. illus. plate 456. Tooley, R. V., The Mapping of America, p. 170, derivative 9, State 1. Stephenson, R. W., and McKee, M. M., Virginia in Maps: Four Centuries of Settlement, Growth, and Development, p. 39. Verner, C., 'Smith's Virginia and its Derivatives; a Carto-Bibliographical Study of hte Diffusion of Geographical Knowledge', Map Collectors' Circel, no. 45. Morrison, R., On the Map: An Exhibit and Catalogue of Maps Relating to Maryland and the Chesapeake Bay Honoring George Washington at th Beginning of the Third Century of Washington College at Chestertown, Maryland, p. 17. Baer, E. Notes to Accompany a Facsimile of John Speed's A Map of Virginia and Maryland 1676, no. 86.